There are many ways to get to and around Downtown Tempe. Leave your car at home and use one of these options. Take the Light Rail to get to Downtown Tempe from Downtown Phoenix and Downtown Mesa. There are two stops in Downtown Tempe, one at 3rd Street and Mill Avenue and another at the Transportation Center. For schedules and more information, visit Valley Metro. The FLASH Neighborhood circulator is a free service that circulates around the perimeter of Arizona State University's Tempe Campus. Connect from Downtown Tempe to ASU from the multiple stops along University Dr. The ORBIT Neighborhood circulator is a free service connecting Downtown Tempe to surrounding Tempe neighborhoods. Click here for a full schedule and route information. VALLEY METRO BUS brings The Valley to Downtown Tempe. Multiple routes run through Downtown, centralized in the Tempe Transit Center located on 5th St and Forest. Click here for pricing, routes and schedules. 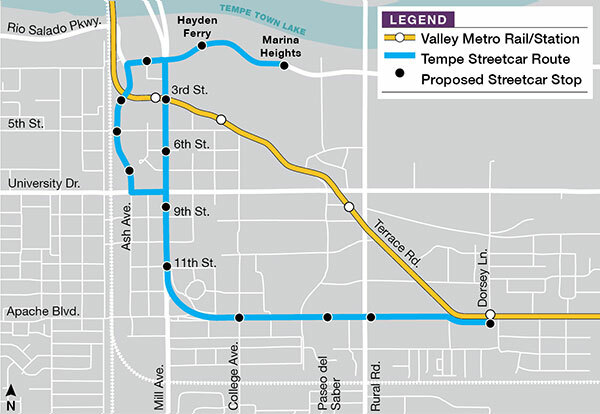 Valley Metro and the City of Tempe are bringing a new Streetcar to Downtown Tempe. For up to date information on the project status and timeline, visit Valley Metro. Below is the current route map for the Streetcar. Streetcars create a complete transit system and allow for a car free lifestyle for those living in Downtown Tempe.